For those of you that follow Juicy Bites, I’m SURE your wondering where the heck I have been! Or…at least I like to think you have all been wondering that :). I haven’t gone anywhere (except for Maui on vacation!). I have been right here, thinking about how I should be blogging, but not finding the motivation to do it. While we were in Maui, my 6 year old Finn asked me, “Mommy, did you forget that you have a blog?”. Ouch! Guess it had been a while since I had talked about it or posted anything. I have come up with a lot of excuses not to blog some of the things I have been cooking. First off, it is a bit time consuming. Then there is the fact that you actually have to make something “blog worthy” to post. I know there is a really wide variety of people that seek out food blogs for recipes. I was finding myself thinking that even though I made something delicious, I would worry that some readers would think it wasn’t healthy enough, some readers would think it was too healthy, some readers would think it wasn’t easy enough, or people just plain wouldn’t be interested. I got a little caught up in what it was that I wanted this blog to be all about. I needed to remind myself why I started Juicy Bites in the first place. I wanted a “cook book” of the things that my family and I love to eat. A place to record all of the juicy bites that I make at home. Sometimes those things are super healthy, like my Chia Seed Breakfast Bowl, and sometimes they are super easy, like my Super Quick Fish Tacos. I thought it would be a great way to record my favorite recipes, and share them with my family and friends. Sometimes when I ask my son, Max, what he wants for dinner, he will say he wants to look at my blog and pick something out. I kind of LOVE that! So, I guess I better keep up with this and not worry about weather anyone else wants to make whatever it is that I posted. And, if they do…fabulous!! So let’s talk about this salad! 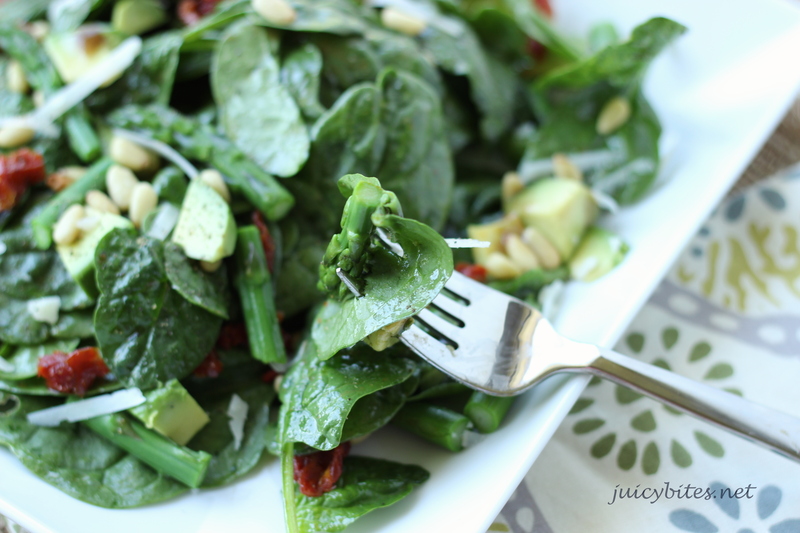 A while back my good friend, Lori, made a similar salad when I had her family over for dinner. I have loved it ever since and it has been on my blogging to do list for a while. I decided to make it for lunch yesterday and forced myself to take some pictures before gobbling it up! 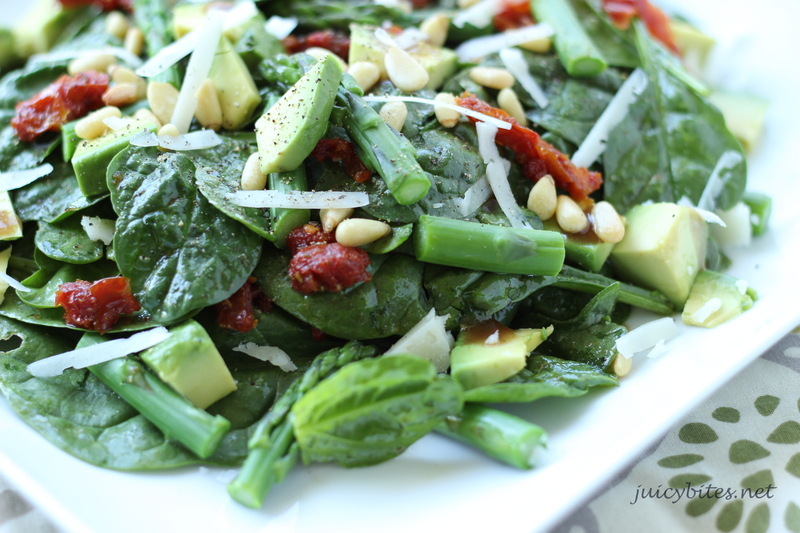 It is a delicious combo of baby spinach, blanched asparagus, sun-dried tomatoes, and avocado. I topped it with a little shaved manchego cheese and toasted pine nuts. 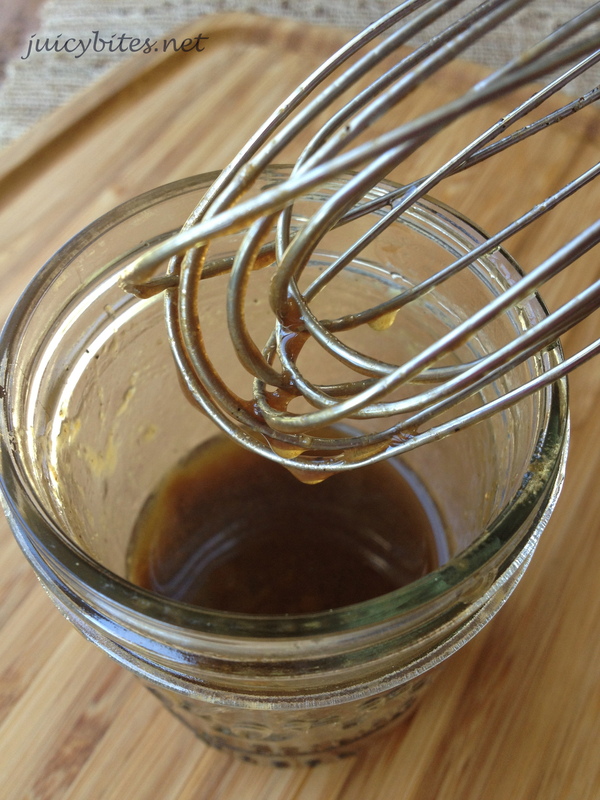 The dressing is a balsamic dijon vinaigrette, really simple and delicious! There are a ton of adaptations you could make with this. My friend’s original version had arugula instead of spinach (which was really good!) and Marcona almonds instead of pine nuts. You could also use what ever cheese you have on hand. Shaved parmesan would be great. 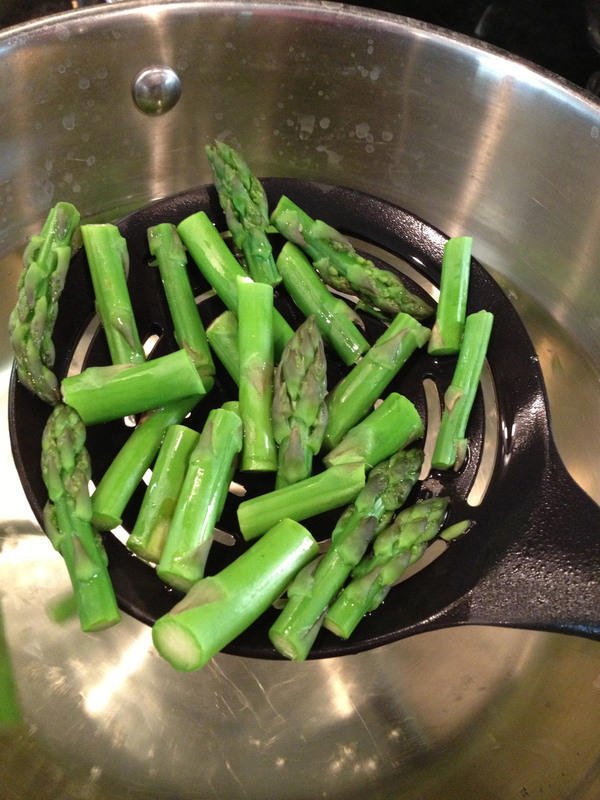 This salad is simple to make…just a quick blanch for the asparagus before hand. And when I say quick, I mean like a minute or less! When you blanch a veggie, you want your salted water to be at a full boil. Throw your veggies in and be ready to get them out pretty quick and put them straight into an ice bath to stop the cooking and keep the texture crisp and the color bright. After a few minutes in the ice bath, drain and let them dry on paper towels. You can do this step in advance and refrigerate until you are ready to use it. Avocados are plentiful right now in California and they are oh so good! We go through at least a couple a day in my house. For a salad I like my avocados “firm ripe”, which means I don’t want them too soft, but just so they give a little when you press on the skin. A “firm ripe” avocado holds together better when you are tossing a salad. 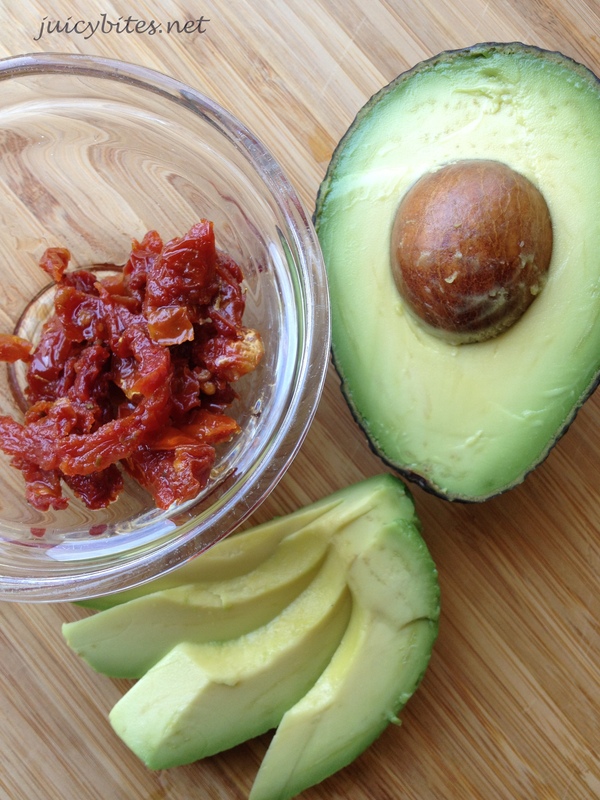 Save the soft ripe avos for guacamole or avocado toast (a favorite breakfast around here). The dressing I made is a simple balsamic vinaigrette. I love the sweetness from the balsamic vinegar. A little dijon mustard adds just the right kick. This is a good time to bust out your best olive oil. 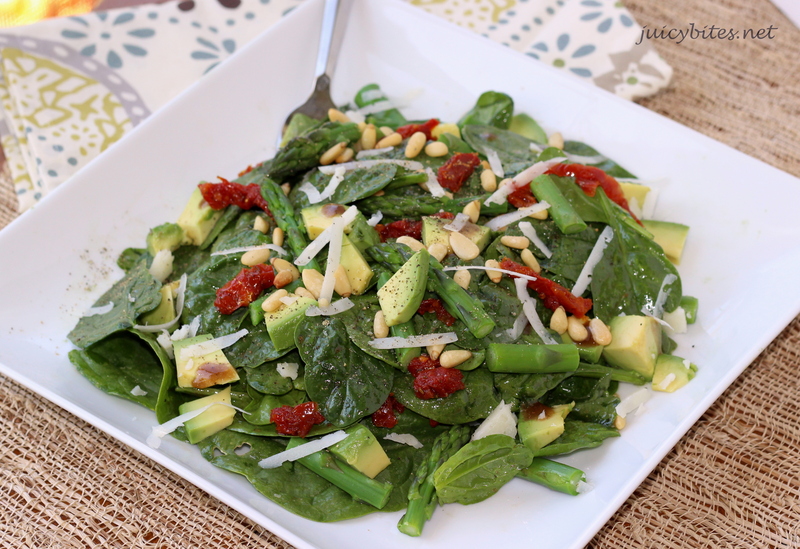 I used a Spanish olive oil with amazing flavor…it really makes the dressing! This recipe made more than enough for my salad, so depending how much you use, you may have a little left over. a couple ounces of shaved hard aged cheese (like manchego, parmesan, or romano) – a vegetable peeler works great for this! 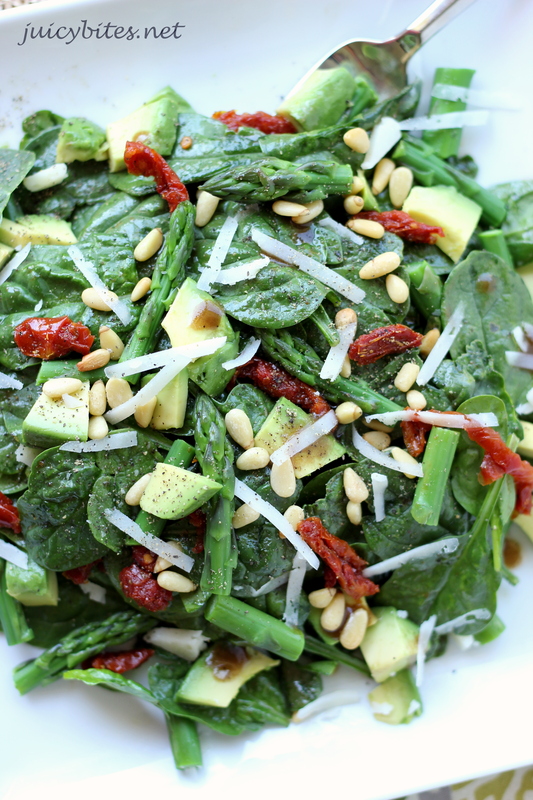 Toss the spinach, asparagus, sun-dried tomatoes, and diced avocado together with the dressing (how much you use depends on how “dressed” you like your salad, it’s best to start with a little and add more if it needs it). Season with plenty of salt and pepper (this is important…avocados scream for salt and pepper!). Top with the shaved cheese and toasted pine nuts. Whisk all of the ingredients together in a small bowl. Refrigerate any unused portion.